Prevention of cavities. For Sensitive Teeth, Tartar control, Fresh breath, Whitening. Healthy Mouth All Natural CoQ10 Tooth Gel guards your teeth and gums from sugar acids and tooth decay. Tea Tree Oil, a well-known antimicrobial and antiseptic agent, works with Fluoride to help defend the entire oral cavity from the bacterial growth that could lead to tartar build-up and periodontal disease. Natural Grapefruit Seed and Perilla Seed Extracts help reduce tartar build-up while CoQ10 and Aloe Vera Gel soothe gum irritation. A refreshing Cinnamon chill keeps your breath fresh all day. 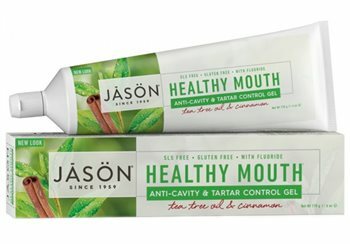 For a healthy smile and fresh breath, use Jason Healthy Mouth toothpaste and mouthwash twice a day. Glycerin, Aqua (Water), Silica, Sodium Cocoyl Glutamate, Xylitol, Aloe Barbadensis Leaf Juice*, Bambusa Arundinacea Stem Powder, Carum Petroselinum (Parsley) Extract, Citrus Grandis (Grapefruit) Fruit Extract, Perilla Ocymoides Seed Extract, Stevia Rebaudiana Leaf/Stem Extract, Cinnamomum Zeylanicum Bark Oil, Eugenia Caryophyllus (Clove) Flower Oil, Melaleuca Alternifolia (Tea Tree) Leaf Oil*, Melia Azadirachta Seed Oil, Calcium Carbonate, Cellulose Gum, Dimethyl Sulfone, Menthol, Sea Salt, Tocopheryl Acetate, Sodium Bicarbonate, Sodium Magnesium Silicate, Ubiquinone** *Certified Organic Ingredient; **Coenzyme Q10.